Yikes. That’s quite the literal and metaphorical buzz kill. It wasn’t so long ago that it seemed you’d see a small cluster of honey bees – specifically, European honey bees, or if you’re the scientific type, Apis Mellifera – frantically examining every flower you came across. But if you want to get an idea of what’s happened to honey bees in recent years, just go out and try to take a picture of one. They’re not so easy to find any more. Experts at the Center for Research on Globalization reported in 2015 that over the previous five years, nearly one-third of the United States’ bee population vanished. And that’s not good for any of us. A really bad place, indeed. And not just because we wouldn’t have honey to make all those breakfast cereals or sweet candies. 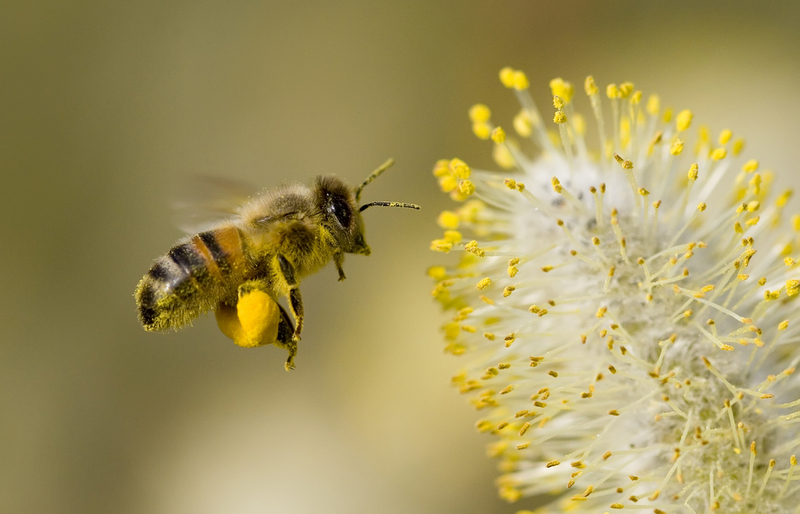 Bees are one of our planet’s primary pollinators, transferring pollen and seeds from flower to flower, fertilizing plants so they can produce fruits and vegetables. In the US alone, honey bees pollinate about $15 billion worth of crops each year, including all kinds of fruits, vegetables, melons and nuts. Every spring, California’s almond growers truck in half of America’s honey bee population to fertilize more than 80% of the world’s almond supply. Honey bees even have an impact on meats and dairy products, pollinating crops like alfalfa that feed our nation’s cattle. Concerns about the future of our food system spurred Bonner to start Bee Downtown, a company that creates and sells rooftop and clear storefront observatory hives in urban locations. 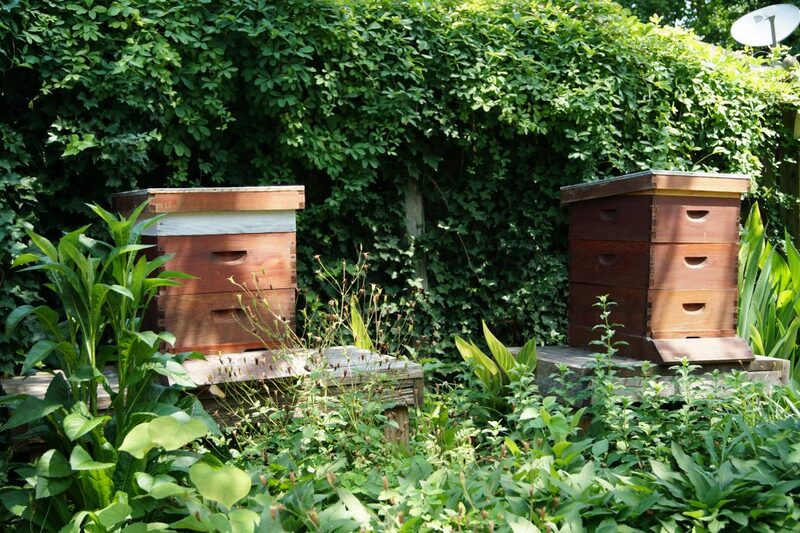 Despite what you might assume, bees thrive in cities, with downtown hives serving as feeder populations to rural areas, as newborn queens fly off to start colonies elsewhere. There’s a lot of debate among bee experts about what has caused the bee population to decline so rapidly. Some cite climate change, others say it’s parasites or pesticides, and there are those who blame habitat destruction or a combination of these forces. Bonner will leave that conundrum to the researchers while Bee Downtown concentrates on enabling bees to thrive in the urban environments they seem to prefer. Bonner’s family has a history of beekeeping; her grandfather has been keeping bees for more than 60 years and her uncle, Jerry Flanagan, has attained master beekeeper status. Flanagan unwittingly played a role in the founding of Bee Downtown. When Bonner spent a semester in Spain during college, she gave her host family a jar of her uncle’s honey. That led to a conversation about Spain’s rooftop beekeeping efforts, leaving Bonner to wonder why North Carolina wasn’t doing something similar to help increase the state’s honey bee population. 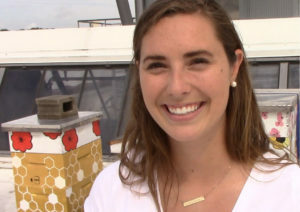 As an intern at the American Tobacco Campus, she asked for permission to put a single hive on the roof of the Power Plant Gallery. The idea caught on and today, the rooftop is now home to more than 500,000 bees, living in hives sponsored by Triangle-area businesses. Education is another major part of Bee Downtown’s efforts, with Bonner regularly holding classroom sessions at Triangle-area schools about the importance of bees to our food system. Like any good entrepreneur, Bonner has big plans for Bee Downtown. After nearly a year in business, her company has received national attention, raising awareness of the honey bee crisis. Bonner hopes some of the educational sessions she holds for Triangle-area school children will produce another generation of bee-conscious citizens. And she’s exploring other cities where hives could be installed. Meanwhile, Bee Downtown will try to make sure Einstein’s theory on how long mankind will last without honey bees is never tested.